Today's Gospel communicates a message that my family and I have talked about over email this week. The words remind us how worrying is not necessary when God is a part of your life, when you trust that he will provide. My sister first wrote about this message on Thursday, reflecting in her thoughtful way. Then my mom mentioned it too after hearing today's Gospel, noting how worrying "really does rob you of the present." "No one can serve two masters. He will either hate one and love the other, or be devoted to one and despise the other. You cannot serve God and mammon. "Therefore I tell you, do not worry about your life, what you will eat or drink, or about your body, what you will wear. Is not life more than food and the body more than clothing? Look at the birds in the sky; they do not sow or reap, they gather nothing into barns, yet your heavenly Father feeds them. Are not you more important than they? Can any of you by worrying add a single moment to your life-span? Why are you anxious about clothes? Learn from the way the wild flowers grow. They do not work or spin. But I tell you that not even Solomon in all his splendor was clothed like one of them. If God so clothes the grass of the field, which grows today and is thrown into the oven tomorrow, will he not much more provide for you, O you of little faith? So do not worry and say, 'What are we to eat?' or 'What are we to drink?' or 'What are we to wear?' All these things the pagans seek. Your heavenly Father knows that you need them all. But seek first the kingdom of God and his righteousness, and all these things will be given you besides. Do not worry about tomorrow; tomorrow will take care of itself. Sufficient for a day is its own evil." "[Our family] tend[s] to worry... a lot. I would say it's in our nature, but God should be our nature and worrying is not in God's nature. God takes our worries away! I journaled yesterday about [Luke 12:22-25, 27-28... which is similar to today's Gospel from Matthew]. "It's true... what do we get from worrying? Nothing. It makes the present unpleasant and doesn't help the future. It's so much easier said than done and I know I spend a lot of my life yo-yoing back and forth with God. God here you go... take my life. But when it seems to be moving in a different direction than I want, I start taking back control. What good does that do? Confident assurance in His plan. That's my theme of the week and boy have I been struggling with it. You know what's crazy though? I got an FCA daily reflection about Jeremiah 29:11 - For I know the plans I have for you...... And then my friend wrote a God-inspired blog last night that totally spoke to me when I read it this morning. God just wants to be with me in all that I do. He WANTS to take our worries and anxieties away whatever they may be, however small or big they are. "I could go on forever, and it's a life-long process obviously. We are put on this earth for a reason. God predestined us to live for Him. We are saved because He decided to save us.... I think this is a rough time of the year for a lot of people, but the sun will always be shining and God will always be with us. I think the past couple weeks I've been all over the place and haven't been spending time talking to God as much. This week has been a very nice time to take a step back and talk to my Friend that I've been neglecting. I've journaled a couple times. I think that's my favorite way of praying. It's just like talking. When I start I ask Him to be with me and it's pretty crazy what comes out as I start typing. The end is always much better than the beginning.... The weather has been amazing this week which I love [she lives in Texas]...and it's one little thing to praise God for. It's all about the little things sometimes. When the big storm is upon you, God steps in and dominates it in little things. Don't tell God how big your storm is; tell the storm how big your God is." I found her words so insightful and her feelings so familiar. Worrying is something I struggle with... but worrying is not a productive action. When I can't control a situation, when I feel helpless, I can only give my anxiety over to God and trust that he will take care of me. When I can't do anything else, I can pray. 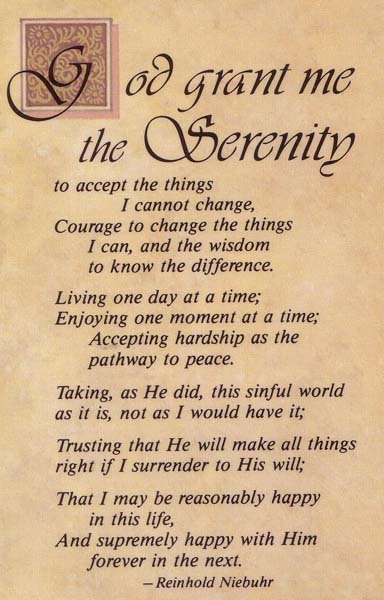 For that reason, I take comfort in the serenity prayer. Love the Serenity prayer and am working on my worrying habit! Thanks for the insight. Your article is useful for a lot of people.